Do you know that feeling of craving something sweet and nutritious at the same time? If so, this recipe might be just what you’re looking for. 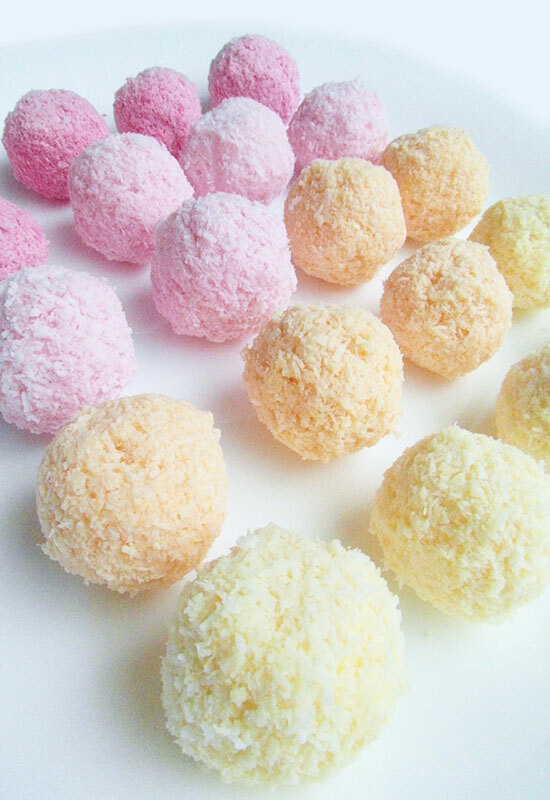 These cute unicorn coconut fruit bliss balls are sweet, creamy and coconutty with a splash of fruit. The ingredients are 100% natural, full with vitamins, minerals and healthy fats. And they’re so easy to make! I love adding a unicorn / rainbow twist to any food I can. Since I discovered natural food coloring from fruit and vegetable juices, spices and herbs I’ve been adding color to all of my recipes. Colorful food is so much fun to eat, especially when it’s all natural and healthy. These coconut fruit bliss balls make a great snack for parties, when you have guests over or to treat yourself. They are very light too, which makes them the perfect pre-workout snack for an extra energy kick. 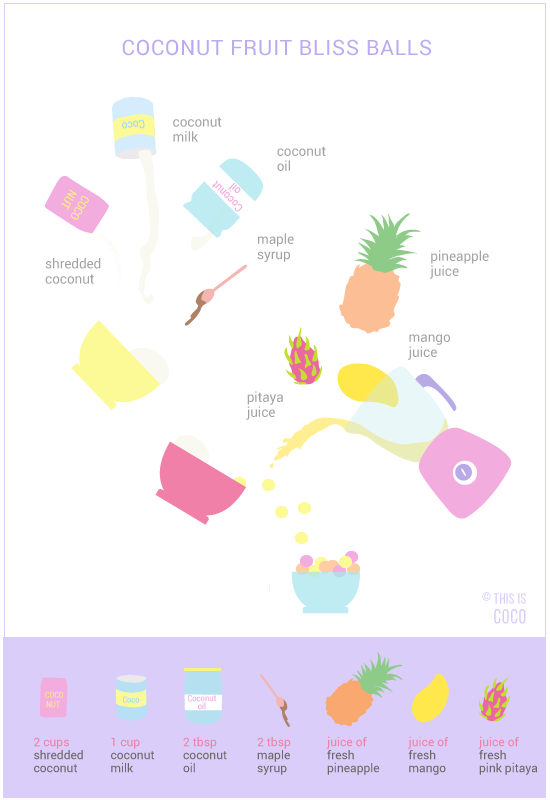 To create these beautiful soft colors you need fresh fruit juice. You can use a blender or juicer and get creative with different kinds of fruit. Berries are also great for different shades of pink. Mix 2 cups of unsweetened shredded coconut with 1 cup of coconut milk in a food processor or by hand. Add 2 tbsp of virgin coconut oil and maple syrup or coconut nectar. Divide the coconut mixture into separate bowls and mix in the natural food coloring. You will need between 1 tsp – 1 tbsp depending on the color intensity you want. Roll little balls with your hands and put them in the freezer to set for a few hours. You can serve them straight from the freezer or let them sit at room temperature for half an hour if you like them softer. If you’re making a bigger batch of unicorn sweetness, take out what you need and leave the rest of the coconut fruit bliss balls in the freezer for next time. 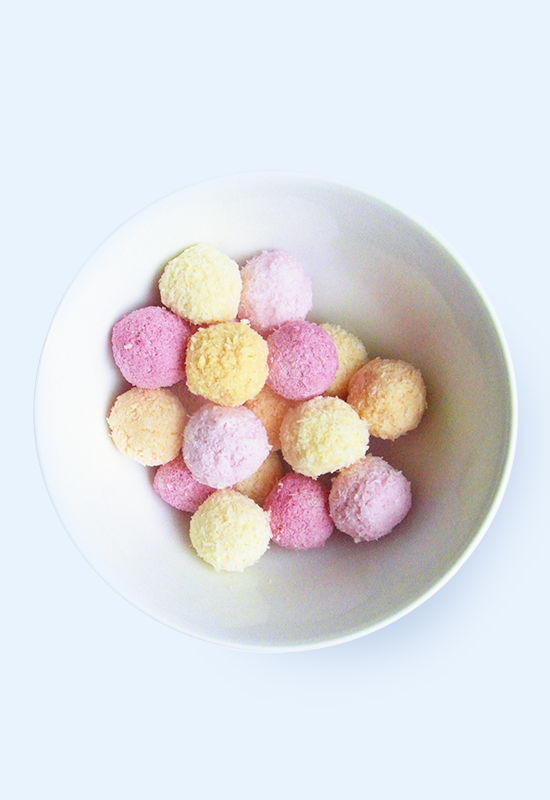 You can also make these with a layer of homemade chocolate – see my recipe for pastel bounty balls.